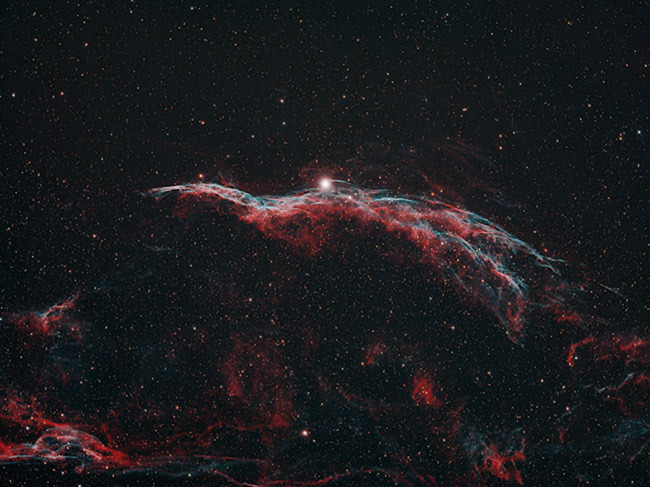 The Western Veil Nebula is a supernova remnant consisting of oxygen, sulfur, and hydrogen gas. This area of Cygnus is densely populated with stars and includes regions of heated gas that make up the Cygnus Loop. As APOD so eloquently puts it, the Western Veil Nebula is “an expanding cloud born of the death explosion of a massive star”. NGC 6960 (Caldwell 34) is often referred to as the Witches Broom as its delicate filamentary structure resembles this memorable shape. On this page, you will see astrophotography image examples using a DSLR camera, and a one-shot-color astronomy camera using narrowband filters. 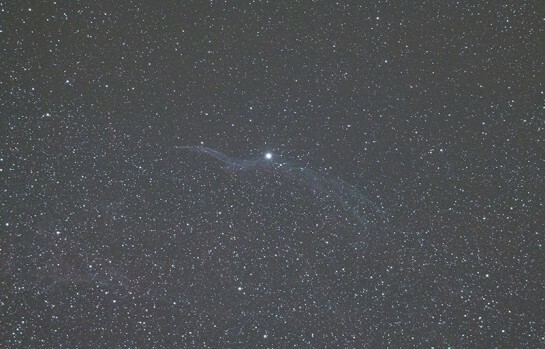 My latest edition of the Western Veil Nebula was captured from my Bortle Class 8 skies in Ontario, Canada. The image above was captured using a one-shot-color astrophotography camera through a small refractor telescope. A duo-narrowband filter was used to help isolate the light wavelengths associated with hydrogen and oxygen gases (Ha and OIII). You can view a larger version of this image on Flickr. 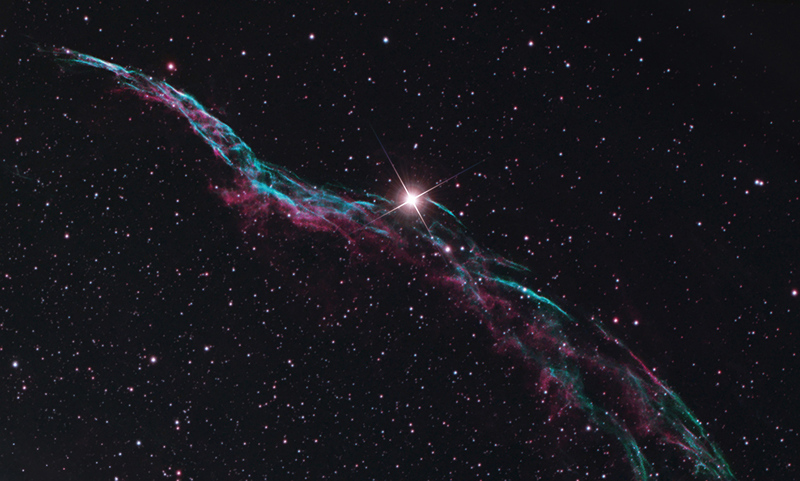 To capture the Veil Nebula through astrophotography requires patience, and a specific image processing approach. NGC 6960 resides in a countless sea of stars that must be tamed before the Western Veil Nebula will emerge. 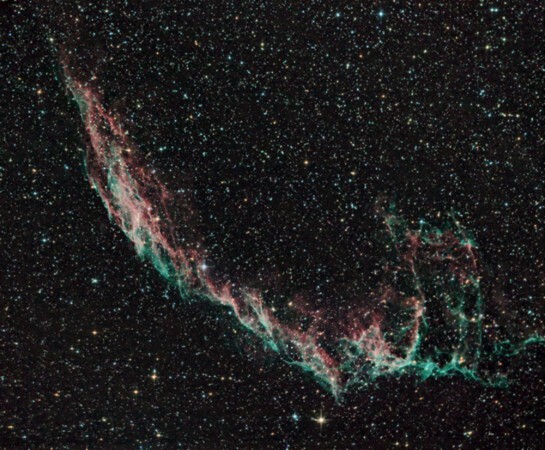 Below, is a wide field photo of the Western Veil Nebula captured using a DSLR camera and a small refractor telescope. A DSLR camera like the Canon EOS Rebel Xsi used for the shot below is a great way to enjoy deep sky astrophotography through a telescope. The camera had recently been modded for astrophotography by manually removing the stock IR cut filter above the sensor. This modification certainly helps to record more structure in nebulae such as this, but it is not essential to photograph the Veil Nebula. In August of 2017, I attempted to capture the Western Veil Nebula using Narrowband images from a color camera, the Altair Hypercam 183C. The image below adds Ha and OIII details to the true color broadband data for a Narrowband/RGB Composite. The RGB details of this image were captured using a UHC filter (Ultra High Contrast). The Baader UHC-S was effective at reducing much of the unwanted light from my backyard sky, although I prefer the more natural look the Baader Moon and Skyglow (Neodymium) filter creates. This supernova remnant is believed to be produced over 5000 years ago. 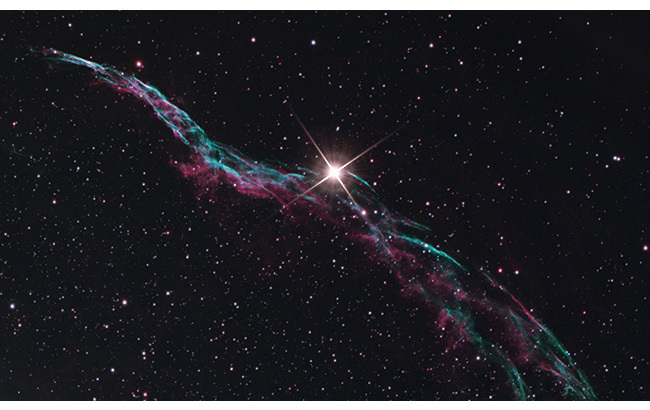 The Cygnus Loop contains the Eastern Veil Nebula and additional emission nebulosity of the same composition. This is one of my favorite nebulas to observe visually. Under the right conditions, you can follow the tendrils from end to end. A telescope with a large aperture is needed, and an OIII filter will help. The Western Veil Nebula contains a naked-eye star known as 52 Cygni, which will help you locate the nebula with your telescope. 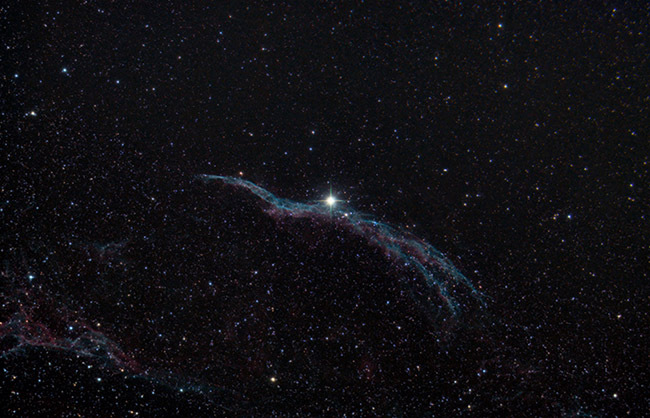 Below, you will see my photo of the Eastern Veil Nebula nearby. The focal length of my telescope (roughly 600mm) could not fit both objects in the same field of view. This image of the Western Veil Nebula was photographed from a friends house out in the country with darker skies than I am used to from the backyard. The toughest part about processing this image of the Western Veil Nebula was reducing the brightness of the stars that surround the nebula. NGC 6960 is located in a very dense area of the Cygnus constellation. Because the surface brightness of the Veil is relatively low, you must stretch the data in the nebulosity to create the contrast between it and the starry background. I use the “make stars smaller” action found in Noel Carboni’s Astronomy Tools Action Set, and ran the image through multiple iterations of this command. It is helpful to mask the nebula while performing this action so you do not lose detail in the object itself. Here are some more excellent deep sky astrophotography targets in the constellation Cygnus that I have captured over the years.